Popular culture can thank the late Sid Avery for some of the most candid and intimate shots of Golden Age Hollywood celebrities. His were slice-of-life photographs that revealed a different side to the icons of the day: real, non-posed images of Dean Martin hamming it up inside a hotel room; Rock Hudson taking a phone call wearing nothing but a bath towel; Marlon Brando playing an impromptu bongos set; Elizabeth Taylor basking in the Marfa, Texas sun on the set of Giant. Based in Los Angeles, Ron continues his father’s legacy at the helm of the Motion Picture and Television Photographic Archive, which handles his dad’s and other celebrated photographers’ bodies of work. He’s also personally overseeing Monroe Gallery’s upcoming The Art of the Hollywood Snapshot exhibit, concurrent with the publication of an eponymous book. Legendary as he was, Avery doesn’t think his father would fare too well in today’s tabloid-driven, crotch-shot-hungry insta-market. Sid’s approach was such, his son recalls, that he managed to win over even the toughest subjects like Humphrey Bogart, who at first was apprehensive, and eventually invited the photog on sailing excursions. Avery also developed an affinity with other giants of the time, such as Ernest Borgnine and Audrey Hepburn. He was one of the select few outside Frank Sinatra’s circle, his son points out, allowed to refer to the crooner simply by his first name. “You’ve just got a feeling that, ‘Wow, this is what it really would have been like to just sit in these people’s houses, or ride with them in the car or be with them,’” Avery says of his progenitor’s style. The imagemaker—who at one point served in the Army Pictorial Service during WWII—would later delve into the world of advertising and directing, and was the man responsible for the notorious Ricardo Montalbán Chrysler Cordoba campaign. Along with a slew of memorable pictures, the show also includes “fresh and different” never-before-seen outtakes and contact sheets, Ron adds, allowing attendees to take in the full grasp of Avery’s career. 5-7 pm Friday, Feb. 1. Free. Same venue. A generous group of galleries reconvened this past weekend, January 17 - 21 at the Santa Monica Civic Auditorium for the 21st annual PhotoLA print fair. Stephen Cohen, PhotoLA's founder, was in good form and seemed happy with the turnout and the exhibitions. The opening night was a wonderful social occasion for the photography community who turned up to benefit the Inner City Arts organization. The hands-down shining moment of the event was a one and half hour lecture by the great Bill Eppridge. There wasn't a dry eye in the house for the moderately attended talk. Monroe gallery artist Eppridge discussed and showed work from his spectacular career as a photojournalist centering on his assignments from the 1960s including the Beatle's first US tour and the Robert Kennedy assassination If there is a photo-book publisher reading this - here is an incredible opportunity to publish a phenomenal monograph. It's hard to say if there were detectible new currents on show this year - there was a surprising number of contemporary female nudes evident in many of the exhibitor's spaces but in terms of one emerging star of the program, none surfaced. Ben Nixon, a young photographer working with 19th century wet-plate technology, had a strong show of his forest work as well as his exquisite new title from 21st Editions. A lot of pigment printing on view, with an exceptional piece by Michael Lang at the Cohen Gallery booth. While many tend to pump the colors of modern ink-jet prints, Lang's images displayed a remarkable restraint and mastery of his craft. Less early 20th century masters on display than in prior years, a greater emphasis on the work of contemporary photographers - a good direction for mid-career image-makers. Most were American although a collective booth showing the work of Czech photography was wonderful. Daniel Miller of the Verge and Duncan Miller galleries hosted a booth for a group of women, all emerging photographers which was a good development. This year an expanded series of seminars, some even tech seminars were added to bring in more photographers who were everywhere this year - a great chance to catch up with friends. All in all, worthwhile, to be sure. Will I attend the 22nd PhotoLA? Photo LA has once again returned to the Santa Monica Civic Center for a 4-day photography exhibition. Photo LA features the best iconic work, vernacular pieces—and also the new frontiers in fine art photography. Classic pieces by Araki, Cartier-Bresson and Lange share space with the new and noteworthy. Garnering attention are Chris McCaw's sunburned negative series, never-before-seen images of Andy Warhol as a model, astonishing work by the Blind Photographers Guild, a new and iconic image of Roger Waters by Jerome Brunet and large lightjet prints by Stephen Wilkes of the Jersey Shore after Sandy. New attendees can attend seminars and go on docent tours to get a guided introduction to the work featured. After last year's success, Emerging Focus—which is open to amateurs—returns with 20 finalists from an international photography competition. There is also a full schedule of workshops and portfolio reviews geared toward student and emerging artists. A larger variety of seminars provides classes on portraiture, lighting, travel, black and white and many other facets of photography. The Emerging Focus programming noticeably changes the demographic of the crowd at Photo LA—there are more students, emerging and aspiring artists, and a new generation of photography lovers and collectors. One of the most important fine art events in Los Angeles, the annual Photo LA gives us a panorama of the state of photography in the art world, as well as the changing face of those who are practicing, embracing and collecting the medium. Photo LA is on exhibit at the Santa Monica Civic Center until tomorrow. For more information about the event check out its website. Photo l.a. – the longstanding photographic art exposition, returned to the historic Santa Monica Civic Auditorium last night for its 22nd edition. The show will run daily through January 21, 2013. Continuing the discourse on photography’s place in the fine arts, photo l.a. provides dealers from around the globe a platform for the exhibition of vintage masterworks and contemporary photography, as well as video and multimedia installations creating the juxtaposition that differentiates photo l.a. from the rest. In addition to the continuation of the lectures, panels, book signings and special installations, photo l.a. is pleased to introduce photoBOOK LA, a new platform for publishers and book artists with guest reviewers offering feedback to photographers on their book proposals. Following the overwhelming success of the Emerging Focus Educational series during last year’s exposition, photo l.a. is announcing its affiliation with Emerging Focus Photo Expo, which will be held across the street at the Hilton Doubletree Hotel. Master classes on photography and portfolio reviews will be part of the schedule. Mapplethorpe at LACMA and the Getty — Los Angeles County Museum of Art curator Britt Salvesen (Robert Mapplethorpe: XYZ) and Curator of Photographs at the Getty Research Institute, Francis Terpak (In Focus: Robert Mapplethorpe), will discuss the simultaneous exhibitions of the artist’s work. Matthew Thompson — curator and author of “The Anxiety of Photography” — will lead a round table discussion with a mix of younger Los Angeles artists including Andrea Longacre-White, Anthony Pearson and David Benjamin Sherry, who hybridize photography with some other media to explore its materiality. Bill Eppridge — noted photojournalist — lectures on his experiences documenting the 1960s, specifically, Robert F. Kennedy’s final campaign. Meg Partridge — filmmaker — will speak about her father, Rondal Partridge, and his photographic work. Rondal Partridge was the son of Imogen Cunningham, whose mentors and colleagues included Ansel Adams, Dorothea Lange and Edward Weston. Josephine Sacabo — photographer — will discuss her trajectory from a documentary street photographer to her current work using the etched photogravure as her exclusive form of printmaking. POINT OF VIEW — selections from Los Angeles collectors will be exhibited with some collectors elaborating on their collecting motivations at a round table discussion. Artillery Magazine hosts one of its infamous Face Off Debates. New Sales Platforms roundtable with Heritage Auctions, 1stdibs and artnet. Visit www.photola.com for open hours. Stephen Wilkes announced today that he will be shooting a "Day to Night" of the 57th Presidential Inauguration on Monday January 21st in Washington, DC. Read more about his Day to Night series, which was recently featured on the CBS Sunday Morning Show, here. And, if you are the in the greater Los Angeles area, be sure to visit us this weekend during Photo la 2013 to view a selection of Stephen's work, including the most recent location of the Day To Night series, Jerusalem, and his photograph of Seaside Heights, New Jersey following Hurricane Sandy. One of Stephen’s most recent projects was documenting Hurricane Sandy for Time. Stephen’s 22 image photo essay on the super-storm disaster is available on Time Lightbox. The aerial photos he captured are both beautiful and horrific. Here’s a quote from his words accompanying the photo essay: “On the Sunday after Sandy made landfall, I decided to rent a helicopter and fly over some of the most devastated areas, including the New Jersey shore, Breezy Point and Far Rockaway. It was a beautiful day to fly, but unfortunately that beauty quickly eroded into shock as we began to get close to the coasts. It was everything I’d heard about, but it was difficult to believe what I was actually seeing. Once we got above the shoreline, I really started to understand the scale of the destruction. The expanse of land it ruined, the totality of the devastation — it was like a giant mallet had swung in circles around the area. It was mind numbing.” Read more about the Hurricane Sandy project online and see all 22 photos in the essay at Time Lightbox." Full post with links here. See Stephen Wilkes Day To Night and Hurricane Sandy photographs during Photo la, January 17 - 21, at Monroe Gallery of Photograph, booth M-150. ABOUT: Many of the auction houses are still on winter hiatus, but photography collectors know to scout out the wealth of vintage, contemporary, and multimedia works this time of year at the photo l.a. fair at the Santa Monica Civic Auditorium. Among the 45 galleries and nonprofits participating in the 22nd annual edition, the Monroe Gallery of Photography brings the work of legendary photojournalist Bill Eppridge, who is also speaking about his time shooting Robert F. Kennedy in the 1960s as part of the fair’s lecture series, which also includes appearances from Los Angeles County Museum of Art curator Britt Salvesen, filmmaker Meg Partridge, and an Artillery Magazine-hosted debate. In the department of unusual character studies, visitors will find shots from Frank Marshall’s immersion with a subculture of African cowboy metalheads in Botswana, including one of a leather-clad man named “Bound by the Moon,” on offer for $1,500 at Bekris Gallery. And Polish photographer Leon Borensztein’s intimate glimpse of unsmiling Americans can be found at Smith Andersen North. More experimental forms can be found at Susan Spiritus Gallery, which is exhibiting Fran Forman’s nostalgic photo assemblages, like a print of a carousel sinking underwater, priced at $950 (unframed). The fair has made a push this year to welcome not just collectors, but photographers, too, particularly those just starting out. It has partnered with the Emerging Focus Photo Expo, held across the street at the Hilton Doubletree Hotel. There, photographers can stop by with their portfolios for classes and on-the-spot critiques. Or, for those with publishing ambition, this year marks the launch of photoBOOK LA, where experts offer photographers advice on their book proposals. General admission starts at $20 at the door, $25 online. © Estate of Leonard Freed - Magnum Photos (Brigitte Freed). LOS ANGELES, CA.- August 28, 1963, marked a great day for democracy in America. On that day nearly fifty years ago, more than 250,000 people gathered at the National Mall in Washington, D.C., to mount a peaceful protest demanding equal rights and economic equality for African Americans. Led by a contingent of civil rights organizations, The March on Washington for Jobs and Freedom called for the desegregation of public schools, protection of the right to vote, and a federal program to train and place unemployed workers. This demonstration ultimately led to the passage of the Civil Rights Act of 1964, and soon became the iconic expression of social protest that inspired the women's rights movement, as well as rights for the disabled and other disenfranchised groups, and serves to this day as a blueprint for democratic action. This Is the Day: The March on Washington, which will be published by Getty Publications in February 2013 to coincide with Black History Month and the 50th anniversary of the march, presents Magnum photographer Leonard Freed's stirring and nuanced visual testimony of the event that culminated in Dr. Martin Luther King Jr.'s prophetic "I Have a Dream" speech, delivered at the base of the Lincoln Memorial. The 75 photographs in this volume, most of them never before published, were chosen from hundreds of images Freed made in the nation's capital the day before, during, and after the march. These images present spectacular wide-angle views of the hundreds of thousands of marchers overflowing the National Mall, intimate group portraits of people straining to see the speakers, and tight close-ups of individual faces filled with hope and yearning. Freed's images reveal the powerful impact of the march, which took place in the midst of the civil rights movement, when racial inequities were being most painfully exposed to the nation and the world. Freed's holistic approach to photographing the events of this historic day is revealed in the details he chose. In the hours before the march, he photographed the area surrounding the Mall as people arrived in buses and cars, protest signs were being stacked in preparation for distribution, policemen took up their posts, and people passed by the famed Ford Theatre, where a sign reads "House Where Lincoln Died." With the Washington Monument, the Reflecting Pool, and the Lincoln Memorial as his visual anchors, Freed photographed the massive crowd as it gathered and swelled, and then went in tight to capture groups of marchers chanting and singing in their Sunday-best clothes, a range of individual expressions, and the interplay of text and image on placards. He photographed well into the evening when the remaining marchers linked hands for a final rendition of "We Shall Overcome," and the aftermath as the crowds dispersed and the visual remains of this history-making event were reduced to placard scraps blanketing the ground. Return Visits to Washington, D.C. Freed would return to the National Mall numerous times to photograph other marches and rallies, including Vietnam War protests. In 1964 he photographed individual African Americans exercising their right to vote for the first time, and in the same year made an iconic photograph--reproduced in the book--of Dr. Martin Luther King Jr. being celebrated in a Baltimore motorcade after receiving the Nobel Peace Prize. This Is the Day includes a selection of Freed's images from the 20th Anniversary March of 1983. These photographs, which reveal a more casual trend in American style and dress, from the dark suits and pearls of 1963 to T-shirts and shorts in 1983, show a youthful Jesse Jackson three months before he declared he would run for president and placards calling for President Reagan to cut the military budget. Freed was born in Brooklyn, New York on October 23, 1929, to a working-class Jewish family of Eastern European descent and strong social values. Working in Germany in the 1960s Freed photographed a black soldier standing before the Berlin Wall and was struck by the realization that while this soldier was defending freedom in Europe, his brothers and sisters were fighting for their own freedom at home. This thought inspired him to return to the United States and produce a photo-essay examining the daily life of blacks across America, from the East Coast to the Deep South. His resulting photo-essay culminated in the book Black in White America, first published in 1967/68 and reissued in 2010 by Getty Publications. It was during the course of this project that Freed photographed the March on Washington. After Freed's death in 2006 his widow, Brigitte, was inspired to compile a book on the March on Washington from her late husband's archive when she heard then-Senator Barack Obama remark to an audience of civil rights activists, "I stand here because you walked." Accompanying the photographs are a first-hand, backstage account of the preparations leading up to the march by civil rights activist and author Julian Bond; an introduction to the importance of the march, and Dr. King's involvement, by sociology professor and author Michael Eric Dyson; and an informative discussion of Freed's approach to the photographic project by scholar Paul Farber. A book launch event will be held at 12 Noon on Tuesday, February 5 at The Library of Congress's Center for the Book in Washington, D.C., as part of its "Books & Beyond" program. The event is a conversation with Brigitte Freed and authors Paul Farber and Michael Eric Dyson who will discuss the significance of the march and how its legacy lives on in the present day. The conversation will be followed by a Q&A and book signing. The event takes place in the West Dining Room, Madison Bldg. (101 Independence Avenue, SE, Washington, DC, 20540). Many other activities are being planned throughout the year. Leonard Freed (American, 1929-2006) began making photographs in 1954 and joined Magnum Photos as a full-time member in 1972. He photographed extensively in Germany, Holland, Italy, and Israel, and published numerous books and photo-essays. It was, however, his coverage of the American civil rights movement in the 1960s that brought him the most acclaim. Getty Publications reissued his book Black in White America, first published in 1967/68, in 2010. Freed's photographs are included in the collections of the Museum of Modern Art in New York, the Metropolitan Museum of Art in New York, and the J. Paul Getty Museum in Los Angeles. Julian Bond is a social activist and civil rights leader as well as a writer, teacher, and lecturer. While a student at Morehouse College in Atlanta, Georgia, during the early 1960s, he helped found the Student Nonviolent Coordinating Committee (SNCC). He was the first president of the Southern Poverty Law Center and was elected to both houses of the Georgia legislature, where he served a total of twenty years. He was chairman of the National Association for the Advancement of Colored People (NAACP) from 1998 to 2010 and is professor emeritus in the Department of History at the University of Virginia, Charlottesville. Michael Eric Dyson is a widely published writer, media commentator, and professor of sociology at Georgetown University in Washington, D.C. He is the author of sixteen books, including April 4, 1968: Martin Luther King, Jr.'s Death and How It Changed America and I May Not Get There With You: The True Martin Luther King, Jr.
Paul M. Farber is a scholar, currently completing his doctorate in American culture at the University of Michigan, Ann Arbor. He is currently a visiting instructor of Urban Studies at the University of Pennsylvania. Bill Eppridge, noted photojournalist, lectures on his experiences documenting the 1960s, specifically, Robert F. Kennedy's final campaign and the Beatles first US tour. One highlight of the upcoming FOTOfusion will be the presentation of the prestigious FOTOmentor Award to Bill Eppridge, a Life Magazine staff photographer during the golden era of photojournalism when the big picture publications supported numerous pages of great photography. In addition to the award, Mr. Eppridge’s work will be featured in this year’s FOTOmentor Exhibition. Present at some of history’s most famous events, Eppridge’s photographs weave a visual narrative of our times. This exhibition will feature many of his most famous images from the Sixties including the Presidential campaign of Robert F. Kennedy, the Beatles first U.S. visit, the Woodstock Music festival, and his groundbreaking photo essay on heroin addiction in Needle Park. A self-taught photographer, Bill Eppridge later graduated from the University of Missouri Journalism School. Winning first prize in the National Press Photographers competition earned him internships at Life magazine, where he was named a staff photographer in 1964 and stayed until the magazine folded in 1972. Following assignments with National Geographic, Mr. Eppridge spent 30 years traveling the world as a photographer for Sports Illustrated. He has been awarded the Joseph A. Sprague Award, The Missouri Journalism Honor Medal and The Lucie Foundation Achievement in Photojournalism. In 2009, Mr. Eppridge was inducted into the Missouri Photojournalism Hall of Fame. He has published four books and his work is included in major collections and museums worldwide. Bill Eppridge was a Life staff photographer during the golden era of photojournalism when the big picture magazines supported pages of great photography. Present at some of history’s most famous events, Eppridge’s photographs weave a visual narrative of our times. 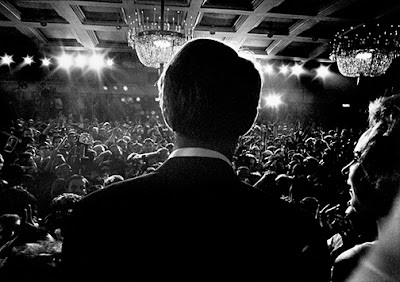 The exhibition features his most famous images from the Sixties including the Presidential campaign of Robert F. Kennedy, the Beatles first U.S. visit, the Woodstock Music festival, and his groundbreaking photo essay on heroin addiction in Needle Park. Mr. Eppridge will present the Rising Star award at the FOTOfusion Awards Dinner on January 23 and will be present at the exhibition’s Opening Reception on January 25. Each year, the PBPC Awards Committee selects a photographer to receive the FOTOmentor Award in honor of his/her lifetime achievements in the world of photography. Previous recipients include distinguished photographers Ralph Gibson, Gordon Parks, Sebastiao Salgado, Arnold Newman, Ruth Bernhard, Duane MichaeIs, James Nachtwey, Michael Kenna, David Hume Kennerly and Robert Glenn Ketchum.